Hello, I was here at patna for a long time and doing what nothing new but studying some php application development and reading some CSS3 guides. And suddenly I got a call from Mr. Srikant who introduced himself as prop. 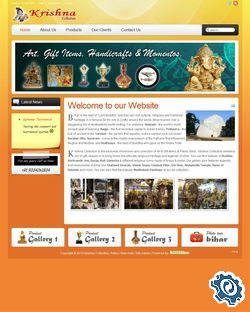 of Krishna Collection, and than only in 15 days we come today to the final release of this Art and gift gallery's website launch. Shivesh Chandra (Programing Back-end) and others. Ok than good day and happy web browsing, thank you for reading my blog you can leave messages to me by commenting or at my Twitter Page.